Photoprotection by sunscreens, clothing and glasses are important to protect the skin against the detrimental effects of sun exposure. In order to achieve complete protection, topical strategies must shield against the range of solar wavelengths ultraviolet A, ultraviolet B, infrared radiation that can damage the skin. To provide the necessary broad spectrum coverage, combinations of chemical and physical UV filters along with molecules that are capable of interfering with and/or preventing the deleterious effects of sunlight are discussed in this review. What was known? Modern topical photoprotection involves both primary protective factors (sunscreens) that absorb or reflect. UV radiation and secondary factors (e.g., antioxidants, osmolytes, and DNA repair enzymes) that can disrupt the photochemical cascade triggered by UV-penetration. Ultraviolet (UV) composes only a small region of the electromagnetic radiation spectrum and is divided into three subdivisions: Ultraviolet C (UVC) (200-290 nm), Ultraviolet B (UVB) (290-320 nm), and UVA (320- 400 nm). Ultraviolet A (UVA) is further divided into UVA1 (340-400 nm) and UVA2 (320-340 nm). Ozone in the Earth's atmosphere absorbs 100% of UVC, approximately 90% of UVB, and virtually no UVA and hence depletion of the ozone layer has lead to a substantial increase in UV transmission to the Earth's surface. The effect of visible light on the skin has received very little attention, compared with UV radiation and its effects on the skin are probably less important than the role of UV radiation. However, visible light sensitivity is an important phenomenon in diseases such as porphyria, solar urticaria, and other idiopathic photodermatoses such as polymorphous light eruption. Modern topical photoprotection involves both primary protective factors (sunscreens) that absorb or reflect UV radiation and secondary factors (e.g., antioxidants, osmolytes, and DNA repair enzymes) that can disrupt the photochemical cascade triggered by UV-penetration, thereby limiting skin damage. Sunscreens have been divided into chemical absorbers (organic) and physical blockers (inorganic) on the basis of their mechanism of action. Chemical sunscreens are generally aromatic compounds conjugated with a carbonyl group. This general structure allows the molecule to absorb high-energy UV rays and release the energy as lower-energy rays, thereby preventing the skin-damaging UV rays from reaching the skin. Physical blockers or nonchemical sunscreens reflect or scatter UVR. They contain inert minerals such as titanium dioxide or zinc oxide. Organic are either UVA or UVB blockers [Table 1]. Padimate O is the most potent UV-B absorber. The decline in its use, along with the demand for higher sun protection factor (SPF) products have led to the incorporation of multiple active ingredients into a single product to achieve the desired SPF, replacing single Para amino benzoic acid (PABA) esters. The absorption profile of octocrylene spans from 290 to 360 nm with peak absorption at 307 nm. The compound has an excellent safety profile with low irritation, phototoxicity, and photoallergic potential. Octocrylene may be used in combination with other UV absorbers to achieve higher SPF formulas and to add stability. Ensulizole or phenylbenzimidazole sulfonic acid is water soluble, and it is used in products formulated to feel lighter and less oily, such as daily use cosmetic moisturizers. It is a selective UVB filter, allowing almost all UVA transmission. Anthranilates are weak UVB filters, and they absorb mainly in the near UVA portion of the spectrum. Anthranilates are less effective in this range than benzophenones, and they are less widely used. Butyl methoxydibenzoylmethane or avobenzone provides superior protection through a large portion of the UVA range, including UVA I. Despite its efficacy and broad spectrum, avobenzone is intrinsically photounstable and significant photodegradation can occur with a loss of 50-90% of molecules after 1 hour of UV exposure. To increase the photostability of avobenzone, molecules such as UV absorber (e.g., octocrylene) and non-UV filter (e.g., diethylhexyl 2, 6-napththalate) are added. Terephthalylidene dicamphor sulfonic acid or Mexoryl SX provides protection within the near UVA range. The compound is photostable, water resistant, and has low systemic absorption. It is a broad spectrum sunscreen, decreasing UVA more than UVB transmission. This molecule offers a broad spectrum coverage with two absorption peaks at 303 and 360 nm. The molecule size is large, minimizing the opportunity for systemic absorption or endocrine-like effects. It acts as a hybrid between organic and inorganic filters, combining the micronized particle technology of inorganic UV filters with an organic molecule and together, these properties serve to absorb, scatter, and reflect UVR. Drometriazole trisiloxane (DTB) belongs to the class of hydroxybenzotriazole molecules. It has broad-spectrum coverage and is photostable. Some of the original sunblocks were opaque formulations reflecting or scattering UVR. Poor cosmetic acceptance had limited the widespread use until micro sized forms became available, also known as inorganic particulate sunscreens. Titanium dioxide is a broad-spectrum UV filter that does not penetrate the stratum corneum. It has undergone a process of micronization for improved cosmesis. Microfine titanium dioxide provides photoprotection against UVB and UVA II (315-340 nm)  but lacks coverage within UVA1 (340-400 nm). Secondary photoprotection involves the use of active agents to counteract the inherent photochemical processes that can induce DNA damage in skin cells. It may be achieved by antioxidants, osmolytes, and DNA repair enzymes, , (e.g., photolyase and T4 endonuclease V). Osmolytes are small molecules that control and stabilize the cellular environment by regulating hydration and responses to stress conditions. Osmolytes (compatible organic solutes) are not only utilized by cells to control cell volumes, but they have been identified as integral parts of the cellular defense against environmental noxae. The osmolytes taurine  and ectoine  have been demonstrated to protect against detrimental UV effects and are incorporated into several commercially available sunscreens. Wearing clothing has been emphasized as an important means of photoprotection. Compared with sunscreens, clothing has a number of advantages. Clothing and hats offer a balanced and uniformed protection for both UVA and UVB but most of the sunscreens deliver more UVB protection. Clothing and hats offer more reliable protection as long as users remember to wear them. By contrast, a user needs to apply sunscreens 30 minutes prior going outdoors and reapply them every 2 hours, and the degree of protection offered by sunscreens depends on application of the correct amount of the product. The protection offered by clothing is measured by ultraviolet protection factor (UPF). UPF is defined as the ratio of average effective UV irradiance transmitted without fabric to the average effective UV irradiance transmitted through fabric. Fabrics are placed into classes based on the calculated label UPF value. The good protection is composed of fabrics with label UPF value of 15-24, the very good protection class is composed of fabrics with label UPF values of 40-50, and 50+ (the highest value permitted on a label). To conclude wearing a colored loose fitting fabric offers the best photoprotection from clothing. UVR filtration by sunglasses is important because it prevents the development of certain ocular disorders including cancers of the eye/eyelid, cataracts, and possibly age-related macular degeneration. Sunglass effectiveness, on the other hand, depends on factors such as size, shape, UV blocking ability, and reflection from the back of the lens. The American Academy of Ophthalmology recommends that sunglasses block 99% of UVR, and those that comply with this standard are labeled accordingly. The United States, the United Kingdom, Germany, Australia, and France have standards for UV protective sunglasses. In our country we do not have any standard guidelines for sunglasses. Dongre et al. studied the UV protective properties of sunglasses in UV phototherapy chambers and reported that the mean reduction in UVA penetration was 84.89% and that in UVB penetration was 68.74%. Thirteen sunglasses (four branded ones and nine unbranded ones) provided greater than 80% reduction in UVA rays and hence wearing sunglasses during outdoor work could provide adequate sun protection. Various technologies are used to make the sunscreens more effective and cosmetically acceptable. Nanomaterials are ultrafine single particles with a diameter less than 100 nm. Nanotechnology is currently being developed for diagnosis and labeling, targeting of drugs, and immunotherapy. In 1999 the Food and Drug Administration (FDA) allowed the use of nanoparticles in sunscreens. The use of nanoparticles improves the texture and cosmetic appeal of sunscreens. The traditionally used physical blockers such as titanium dioxide and zinc oxide are thicker formulations and hence were not cosmetically acceptable. The newer sunscreens containing nanosized products of titanium dioxide and zinc oxidehave replaced the older formulations and these ultra fine particles blend with the skin and are cosmetically acceptable. The use of nanotechnology has revolutionized the field of sunscreens but toxicologists believe that the nanoparticles can be potentially harmful. The penetration of nanoparticles are limited by their molecular size. Lademann et al. investigated the penetration of titanium dioxide microparticles into the horny layer and the orifice of the hair follicle in human skin and found that the amount of titanium dioxide found in any given follicle was less than 1% of the applied total amount of sunscreen. Penetration of microparticles into the viable skin tissue was not detected. The larger surface area of the ultrafine particles can provide an interface for catalytic reactions which can produce free radicals and damages the proteins, lipids and DNA. Nanoparticles can also form complexes with proteins which can escape immunological surveillance. The nanoparticle-protein complexes can also act as haptens, which can induce autoimmune diseases. Further studies are required to determine the safety of nanosized particle sunscreens. This technology consists of styrene/acrylate polymers that form a nonabsorbable material. These spheres are then filled with water, which upon application to the skin, escapes leaving a hollow shell capable of light scattering. These hollow spheres increase the surface area contact of UV filters with incoming UVR, increasing the effective SPF of a sunscreen by 50-70%. There are certain controversies regarding the usage of sunscreens. Schulmpf et al. noted that benzophenone, 3-benzylidene camphor, 4-methylbenzylidene camphor, and octyl-methoxycinnamate increased uterine weight in immature rats. Scientific Committee of Cosmetic Products and Non-Food Products, an European committee based in Belgium, noted that the relative estrogenic potencies of UV sunscreen products, both in vitro and in vivo, were about 1 million less than estradiol, the positive control substance. Thyroid weight was increased by higher 4-methylbenzylidene camphor doses. The UV filter benzophenone 2 inactivates human recombinant thyroperoxidase in vitro and disturbs thyroid hormone homeostasis in rats. The endocrine activity of sunscreens is controversial and future studies are warranted. Regular sunscreen application can delay  or prevent the onset of skin tumors in mice, while other reports also indicate its efficacy against precancerous human lesions. There is also a risk that the regular use of sunscreen could lead to decreased vitamin D levels in the elderly  through the decreased UVB-induced cutaneous synthesis of previtamin D3; but the risk is minimal in tropical climate. The UVB protection offered by sunscreens is measured by the SPF and substanstivity. SPF is a numerical rating system to indicate the degree of protection provided by a sun care product. It is defined as the ratio of the least amount of UV energy (UVB) required to produce minimal erythema on sunscreen-protected skin to the amount of energy required to produce the same erythema on unprotected skin. As UVB is approximately 1000 times more erythemogenic as compared with UVA, the SPF is largely a measure of protection against UVB. The in vivo testing methods are immediate pigment darkening (IPD), persistent pigment darkening (PPD), and the protection factor in the UVA (PFA). These methods are expensive, and require unacceptably high UVA exposure to human subjects. IPD describes the immediate gray-brown pigmentation of the skin as caused by the oxidation of preformed melanosomes in the skin. IPD peaks within the first minute after UVA exposure. The transient nature of IPD which requires immediate testing makes it a less than ideal measurement tool of UVA protection. The PPD method, currently used in Austria and Japan, evaluates sunscreen effectiveness against UVA by measuring melanin photo-oxidation postexposure. PPD is measured between 2 and 24 hours following irradiation and has the added benefit of simultaneously evaluating sunscreen photostability. However, PPD requires subjects be exposed to high-intensity lamps for long periods of time (up to 1 hour). The PFA has a less inclusive endpoint following UVA irradiation, measuring either erythema or pigmentation (tanning). Like PPD, it is evaluated 24 hours after light exposure. In vitro models of evaluating UVA protection present a unique set of solutions and challenges. Unlike in vivo testing, laboratory testing may be a more efficient, reproducible, cost-effective testing method. In vitro method of UVA protection is measured by the Diffey critical wavelength determination. In this method, the sunscreen agent is applied to a substrate, and the UV absorbance is measured along a continuum from 290 to 400 nm. It is then calculated as 'the wavelength below which 90% of sunscreen's UV absorbance occurs. , The UK uses a variation of this in vitro test called the Boots Star rating. The Star system is a ratio of two in vitro tests: the measurement of a product's UVA absorbance to its UVB absorbance. The ideal sunscreen should first and foremost provide superior efficacy with broad-spectrum coverage, photostability, and high substantivity. It should have an appealing feel and uniformly coat the skin surface. Lastly, a sunscreen should be supplied at a reasonable cost to the consumer. The average adult should apply approximately 35 mL for full-body application to cover an area of 1.73 m. , In addition to application density, consumers should be educated on overall guidelines for sunscreen use. The sun-protective clothing is a powerful adjunct to topical sunscreens. Clothing should cover skin first, and sunscreen should be used under clothing as well as to exposed skin. Individuals should avoid time spent outdoors between 10 am and 4 pm. Since the time zones and daylight savings time separates solar noon from the ascribed noon time,  Ting offers a convenient rule of thumb: 'If one's shadow is longer than one is tall,' avoid prolonged outside activity. Eide  refers to this as the 'shadow rule' and patients should avoid this time, when the solar zenith is less than 45 degrees. Reapplying sunscreen after initial application is another important step in effective sun safety. Individuals should apply a first coat of sunscreen half an hour before walking out of the door. A second application approximately 20 minutes after initial application is estimated to prevent an additional 65-80% of UV transmission  and corrects areas of misapplication. Sunscreen should be reapplied every 2 hours and more frequently during activity-filled days. Up to 85% of a product can be removed by towel drying, so reapplication should occur after swimming, sweating, or any other rigorous activity. Complete topical photoprotection can only be obtained if a sunscreen formula protects against UVB, UVA, and IRA. The role of additional wavelengths contributing to skin damage is currently not known. In order to achieve a near complete broad spectrum protection as possible, a sunscreen should incorporate molecules of both of primary and secondary photoprotection along with other photoprotective measures. 1. Hanneman KK, Cooper KD, Baron ED. Ultraviolet immunosuppression: mechanisms and consequences. Dermatol Clin 2006;24:19-25. 2. Lavker RM, Gerberick GF, Veres D, Irwin CJ, Kaidbey KH. Cumulative effects from repeated exposures to sub erythemal doses of UVB and UVA in human skin. J Am Acad Dermatol 1995;32:53-62. 3. Seité S, Moyal D, Verdier MP, Hourseau C, Fourtanier A. Accumulated p53 protein and UVA protection level of sunscreens. Photodermatol Photoimmunol Photomed 2000;16:3-9. 4. Rhodes LE. Topical and systemic approaches for protection against solar radiation-induced skin damage. Dermatol Clin 1998;16:75-82. 5. Kochevar IE, Taylor CR, Krutmann J. Fundamentals of cutaneous photobiology and photoimmunology. In: Wolff K, Goldsmith LA, Katz S, et al. editors.Fitzpatrick's Dermatology In General Medicine, 7 th ed. New York: McGraw-Hill; 2008. p. 797-808. 6. Calles C, Schneider M, Macaluso F, Benesova T, Krutmann J, Schroeder P. Infrared A radiation influences the skin fibroblast transcriptome: mechanisms and consequences. J Invest Dermatol 2010;130:1524-36. 7. Schroeder P, Lademann J, Darvin ME, Stege H, Marks C, Bruhnke S, et al. Infrared radiation-induced matrix metalloproteinase in human skin: implications for protection. J Invest Dermatol 2008;128:2491-7. 8. Schroeder P, Pohl C, Calles C, Marks C, Wild S, Krutmann J. Cellular response to infrared radiation involves retrograde mitochondrial signaling. Free Radic Biol Med 2007;43:128-35. 9. Jantschitsch C, Majewski S, Maeda A, Schwarz T, Schwarz A. Infrared radiation confers resistance to UV-induced apoptosis via reduction of DNA damage and upregulation of antiapoptotic proteins. J Invest Dermatol 2009;129:1271-9. 10. Gogna D, Jain SK, Yadav AK, Agrawal GP. Microsphere based improved sunscreen formulation of ethyl hexylmethoxycinnamate. Curr Drug Deliv 2007;4:153-9. 11. Kullavanijaya P, Lim HW. Photoprotection. J Am Acad Dermatol 2005;52:937-58; quiz 959-62. 12. Nash JF. Human safety and efficacy of ultraviolet filters and sunscreen products. Dermatol Clin 2006;24:35-51. 13. Cole C. Sunscreen protection in the ultraviolet A region: how to measure the effectiveness. Photodermatol Photoimmunol Photomed 2001;17:2-10. 14. Janjua NR, Mogensen B, Andersson AM, Petersen JH, Henriksen M, Skakkebaek NE et al. Systemic absorption of the sunscreens benzophenone-3, octyl-methoxycinnamate, and 3-(4-methyl-benzylidene) camphor after whole-body topical application and reproductive hormone levels in humans J Invest Dermatol 2004;123:57-61. 15. Schallreuter KU, Wood JM, Farwell DW, Moore J, Edwards HG. Oxybenzone oxidation following solar irradiation of skin: photoprotection versus antioxidant inactivation. J Invest Dermatol 1996;106:583-6. 16. Janjua NR, Mogensen B, Andersson AM, Petersen JH, Henriksen M, Skakkebaek NE, et al. Systemic absorption of the sunscreens benzophenone-3, octyl-methoxycinnamate, and 3-(4-methyl-benzylidene) camphor after whole-body topical application and reproductive hormone levels in humans. J Invest Dermatol 2004;123:57-61. 17. Deflandre A, Lang G. Photostability assessment of sunscreens. Benzylidene camphor and dibenzoylmethane derivatives. Int J Cosmet Sci 1988;10:53-62. 18. Lowe NJ. An overview of ultraviolet radiation, sunscreens, and photo-induced dermatoses. Dermatol Clin 2006;24:9-17. 19. Moloney FJ, Collins S, Murphy GM. Sunscreens: safety, efficacy and appropriate use. Am J Clin Dermatol 2002;3:185-91. 20. Dong KK, Damaghi N, Picart SD, Markova NG, Obayashi K, Okano Y, et al. UV-induced DNA damage initiates release of MMP-1 in human skin. Exp Dermatol 2008;17:1037-44. 21. Yarosh DB, O'Connor A, Alas L, Potten C, Wolf P. Photoprotection by topical DNA repair enzymes: molecular correlates of clinical studies. Photochem Photobiol1999;69:136-40. 22. Pinnell SR, Yang H, Omar M, Monteiro-Riviere N, DeBuys HV, Walker LC, et al. Topical L-ascorbic acid: percutaneous absorption studies. Dermatol Surg 2001;27:137-42. 23. Krutmann J, Schroeder P. Role of mitochondria in photoaging of human skin: the defective powerhouse model. J Investig Dermatol Symp Proc 2009;14:44-9. 24. Roshchupkin DI, Pistsov MY, Potapenko AY. Inhibition of ultraviolet light-induced erythema by antioxidants. Arch Dermatol Res 1979;266:91-4. 25. Jurkiewicz BA, Bissett DL, Buettner GR. Effect of topically applied tocopherol on ultraviolet radiation-mediated free radical damage in skin. J Invest Dermatol 1995;104:484-8. 26. Burke KE, Clive J, Combs GF Jr, Commisso J, Keen CL, Nakamura RM. Effects of topical and oral vitamin E on pigmentation and skin cancer induced by ultraviolet irradiation in Skh:2 hairless mice. Nutr Cancer 2000;38:87-97. 27. Yuen KS, Halliday GM. alpha-Tocopherol, an inhibitor of epidermal lipid peroxidation, prevents ultraviolet radiation from suppressing the skin immune system. Photochem Photobiol 1997;65:587-92. 28. Katiyar SK, Korman NJ, Mukhtar H, Agarwal R. Protective effects of silymarin against photocarcinogenesis in a mouse skin model. J Natl Cancer Inst 1997;89:556-66. 29. Elmets CA, Singh D, Tubesing K, Matsui M, Katiyar S, Mukhtar H. Cutaneous photoprotection from ultraviolet injury by green tea polyphenols. J Am Acad Dermatol 2001;44:425-32. 30. Rockel N, Esser C, Grether-Beck S, Warskulat U, Flögel U, Schwarz A, et al. The osmolytetaurine protects against ultraviolet B radiation-induced immunosuppression. J Immunol 2007;179:3604-12. 31. Buenger J, Driller H. Ectoin: an effective natural substance to prevent UVA-induced premature photoaging. 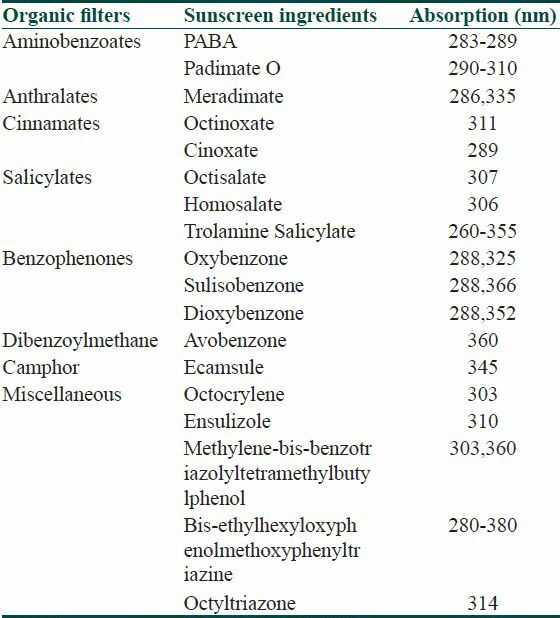 Skin Pharmacol Physiol 2004;17:232-7. 33. Crews PC, Kachman S, Beyer AG. Influence on UVR transmission of undyed woven fabrics. Textile Chem Colorist 1993;31:17-26. 34. Edlich RF, Cox MJ, Becker DG, Horowitz JH, Nichter LS, Britt LD, et al. Revolutionary advances in sun-protective clothing--an essential step in eliminating skin cancer in our world. J Long Term Eff Med Implants 2004;14:95-106. 35. Young S, Sands J. Sun and the eye: prevention and detection of light-induced disease. Clin Dermatol 1998;16:477-85. 36. Dongre AM, Pai GG, Khopkar US. Ultraviolet protective properties of branded and unbranded sunglasses available in the Indian market in UV phototherapy chambers. Indian J Dermatol Venereol Leprol 2007;73:26-8. 37. Maynard A. Nanotechnology: A research strategy for addressing risk. Project on emerging nanotechnologies. Woodrow Wilson International Center for Scholars, June 2006. Available from: http://www.nanotechproject.org/file_download/77. [Last accessed 2007 Dec 1]. 38. Lademann J, Weigmann H, Rickmeyer C, Barthelmes H, Schaefer H, Mueller G, et al. Penetration of titanium dioxide microparticles in a sunscreen formulation into the horny layer and the follicular orifice. Skin Pharmacol Appl Skin Physiol 1999;12:247-56. 39. Borm PJ, Kreyling W. Toxicological hazards of inhaled nanoparticles-potential implications for drug delivery. J Nanosci Nanotechnol 2004;4:521-31. 40. Donaldson K, Stone V, Tran CL, Kreyling W, Borm PJ. Nanotoxicology. Occup Environ Med 2004;61:727-8. 41. Schlumpf M, Schmid P, Durrer S, Conscience M, Maerkel K, Henseler M, et al. Endocrine activity and developmental toxicity of cosmetic UV filters--an update. Toxicology 2004;205:113-22. 42. Schmutzler C, Bacinski A, Gotthardt I, Huhne K, Ambrugger P, Klammer H, et al. The ultraviolet filter benzophenone 2 interferes with the thyroid hormone axis in rats and is a potent in vitro inhibitor of human recombinant thyroid peroxidase. Endocrinology 2007;148:2835-44. 43. Whitmore SE, Morison WL. Prevention of UVB-induced immunosuppression in humans by a high sun protection factor sunscreen. Arch Dermatol 1995;131:1128-33. 44. Wulf HC, Poulsen T, Brodthagen H, Hou-Jensen K. Sunscreens for delay of ultraviolet induction of skin tumors. J Am Acad Dermatol 1982;7:194-202. 45. Thompson SC, Jolley D, Marks R. Reduction of solar keratoses by regular sunscreen use. N Engl J Med 1993;329:1147-51. 46. Matsuoka LY, Ide L, Wortsman J, MacLaughlin JA, Holick MF. Sunscreens suppress cutaneous vitamin D3 synthesis. J Clin Endocrinol Metab 1987;64:1165-8. 47. Scherschun L, Lim HW. Photoprotection by sunscreens. Am J Clin Dermatol 2001;2:131-4. 48. Sunscreen drug products for over-the-counter human use; final monograph. Food and Drug Administration, HHS. Final rule. Fed Regist 1999;64:27666-93. 49. PohAgin P. Water resistance and extended wear sunscreens. Dermatol Clin 2006;24:75-9. 50. Nash JF, Tanner PR, Matts PJ. Ultraviolet A radiation: testing and labeling for sunscreen products. Dermatol Clin 2006;24:63-74. 51. Diffey BL, Tanner PR, Matts PJ, Nash JF. in vitro assessment of the broad-spectrum ultraviolet protection of sunscreen products. J Am Acad Dermatol 2000;43:1024-35. 52. Rai R, Srinivas CR. Photoprotection. Indian J Dermatol Venereol Leprol 2007;73:73-9. 53. Ting WW, Vest CD, Sontheimer R. Practical and experimental consideration of sun protection in dermatology. Int J Dermatol 2003;42:505-13. 54. Eide MJ, Weinstock MA. Public health challenges in sun protection. Dermatol Clin 2006;24:119-24. 55. Lowe NJ. Photoprotection. Semin Dermatol 1990;9:78-83. 56. Diffey BL, Grice J. The influence of sunscreen type on photoprotection. Br J Dermatol 1997;137:103-5. What is new? Complete topical photoprotection can only be obtained if a sunscreen formula protects against UVB, UVA, and IRA. Authors of Document Saewan, N., Jimtaisong, A. 8 A comment on: "update on photoprotection"
Rai, R. and Shanmuga Sekar, C. and Srinivas, C.R.